There are literally millions of blogs littering, or umm, I meant to say lining the internet these days. Many are personal diaries from folks who have some thoughts to share. Many have a newsier bent. And while many people make no money at all from blogging, some make a few bucks or more every month from advertising or selling items. And a handful of the folks treat blogging like a part time or full time job write for larger blogs that are part of networks. I personally do most of my writing for Download Squad, Green Daily, and TV Squad, three blogs that are part of the Weblogs Inc network owned by AOL. 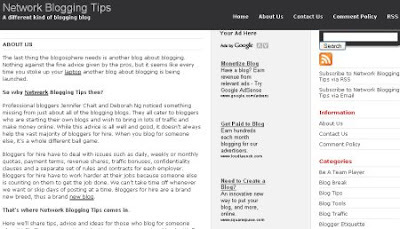 While there are a ton of web sites out there that offer tips on blogging and on making money by blogging (ironically most of the blogs about making money are set up by people who hope to make money by blogging about something that many people are interested in. I’m not convinced that most of the people trying to give out free advice about making money online actually have much advice worth giving), there are very few sites targeted at folks like me: those who write for a blog network/employer. If you think about it, writing for a boss is very different from writing for yourself. If you’re a network blogger you tend to get paid either a salary or paid per post. If you write for yourself, either the work is its own reward, or you’re trying to sell advertising. In both cases, page views are important. But aside from that, they can be two very different jobs. I’ll be curious to see how fresh they can keep the site after the first few dozen posts, but they’re certainly off to a good start. Thanks for the link love, lots of link love actually. 🙂 Hopefully we will be able to keep it fresh – you know, there’s always some new deal going on when you blog for others so… it’s not that tough to write what you do daily. BTW I like Green Daily (I’m a green blogger too) – cool that you blog there. Jennifer beat me to it – but I’ve been meaning to come by and thank you for the link love. I hope you still find us to be relevant – and please don’t be a stranger. Thanks for the link love, lots of link love actually. 🙂 Hopefully we will be able to keep it fresh – you know, there's always some new deal going on when you blog for others so… it's not that tough to write what you do daily. BTW I like Green Daily (I'm a green blogger too) – cool that you blog there. Jennifer beat me to it – but I've been meaning to come by and thank you for the link love. I hope you still find us to be relevant – and please don't be a stranger.